We have officially stopped milking on the main farm. We now only milk at one of our leased farms. We will be out of cows milk from now till August/September of 2018. We are working to have goats milk available during this time period. 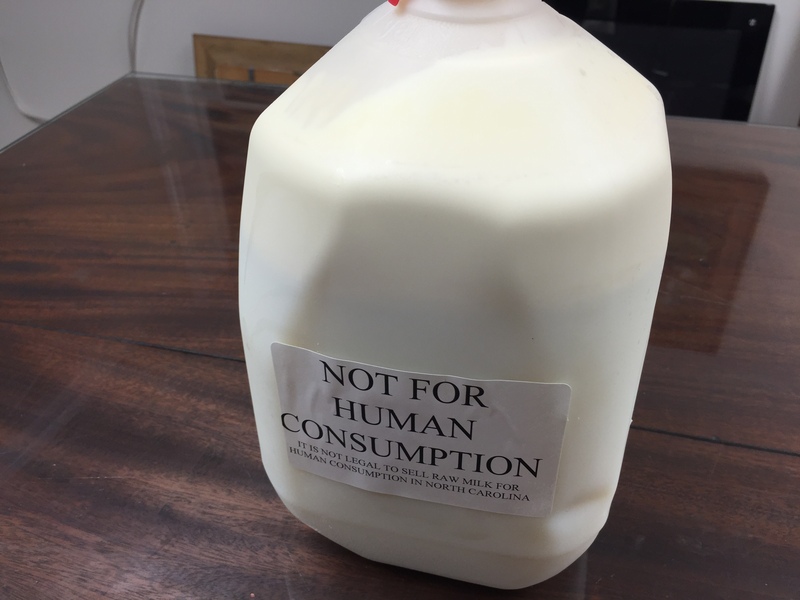 As always, raw milk availability is limited so we cannot guarantee to have milk in the store when you visit. We do try very hard to have it available for you though. Raw milk, note the cream layer on top of the gallon. Awesome! We routinely carry raw milk FOR PET USE. The 1/2″ tall letters on the label (required by NC law) should make that clear enough. This is the real deal, milk, cream, all the goodness nature intended. Raw cow milk is $11 per gallon, $6 per half gallon. Will you have raw milk tomorrow on saturday? Do you currently have any raw milk and raw butter? We restock on Tuesday so on the next day we are open, Wednesday, yes. Will you have raw goat milk 11/07/18? No. No goat milk till about February. The goats are dried off. Hello, do you sell raw butter? Our first batch came in this week. great. is it ever frozen? What is the price? Could you please tell me where this milk comes from? What are the cows are fed? Our milk cows are here on the farm for your inspection. They are grass fed and only given a grain supplement while they are milking as a treat. That is all they get. Well, hay in the winter. They get that. Do you have an A2 bred cows for milk production? We do have A2 cows, but we do not differentiate our milk between our A2 and non-A2 cows so we cannot tell you which gallon is which. We will have goats milk again by the end of February, early March. Do you carry sheep milk? I didn’t see it listed, but figured I’d ask anyway to be sure. We do not carry sheep’s milk. We don’t have any sheep. Thanks for asking though. Audrey, Thank you for thinking of us. I don’t believe it would be possible for us to resell raw milk from another dairy. Fortunately, we now have our own goats at another leased farm and we now have our own goats milk for sale for pet use. Do you have goats’ pet milk for sale? I’m sorry we do not. We don’t own any milk goats. We do have goat cheese from our goat farmer though. Is there a discount if you purchase a larger quantity of PET MILK? We don’t really have large quantities of pet milk. 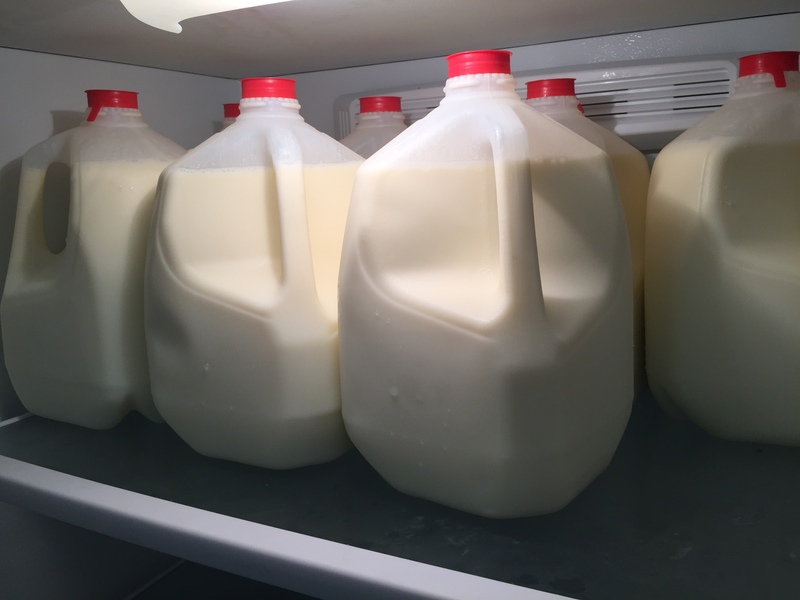 We usually have a few gallons in the fridge most of the time but it goes out as it comes it so we’d never have a bulk purchase amount. Sorry. Only the whole milk with cream. We have non-raw cream only. I just watched a symposium on Raw Milk and Im blown away from RawMilk.com and Westin Price I believe his name is…. Yes ma’am. Weston A. Price is the name. The local chapter leader is one of our customers.